The Gospel Oak to Barking line is having a rough time at the moment, thanks to totally-ballsed-up electrification works. Network Rail were supposed to have the gantries up and ready last spring after a six month shutdown, but bad project management meant two more line closures have been required. The first of these was for five weeks ending last month, and on 18th November a further eight week closure will begin, forcing the Goblin's usual clientele onto a godawfully slow rail replacement bus service, again. 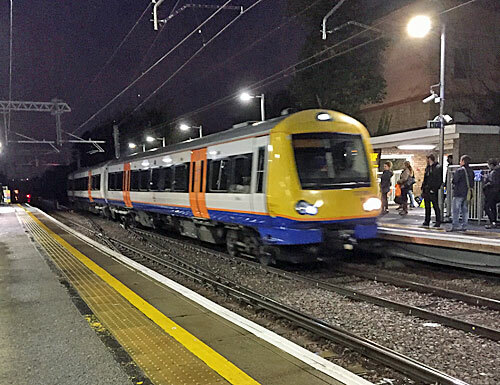 I've taken advantage of this brief engineering hiatus to ride one of the Overground's very special trains, the so-called PIXC-buster service. It's 17:10 at South Tottenham station. The train west to Gospel Oak is just leaving, so it ought to be 15 minutes until the next one, but instead there's a special train due in nine. It's already visible waiting in the distance, but not in the direction you'd be expecting, because it has to drive up from the depot at Willesden. This is the 'spare' train, the seventh set they keep on standby in case one of the other six goes wrong, but if all's well it slips out in the evening to make this single mercy dash. Dozens of people on the eastbound platform are a bit confused as to why what they think is their next train isn't getting any closer, until an announcement eventually confirms "The approaching train is not scheduled to stop here", and the PIXC-buster rides slowly through, its interior dark. It then hides up the line, at a crossover just round the bend, giving the driver the opportunity to turn on the lights and swap ends. I should point out that all of this manoeuvring is cunningly inserted into a lengthy gap between other scheduled trains so as not to get in anyone's way. And then, just as the next eastbound train arrives to clear the opposite platform, the PIXC-buster slips in heading west. The Next Train Indicator briefly lies, stating that the approaching train is not scheduled to stop here, before changing its mind and correctly announcing that this is the 17:19 to Gospel Oak. Five of us step aboard. The train is empty and smells (sweetly) of detergent. It's the middle of the rush hour in the middle of the line and yet I have the choice of any seat in the carriage, apart from that occupied by my other fellow passenger. And it doesn't get much busier at the next couple of stations either. I wonder whether any of the handful of people getting on are here because they know this capacious train exists, or whether they just happen to have turned up at the station six minutes early for the usual quarter-hourly departure. Whatever, this short run isn't the actual PIXC-buster, it's a rolling stock manoeuvre to get an extra train in place for a bonus journey heading east from Gospel Oak. Which is where things get complicated. The train ahead of us, which would normally sit in the platform at Gospel Oak for 12 minutes, now has to get out of our way. It's therefore timetabled to depart earlier than it normally would, so it gets to form the 17:28 bonus train, while the spare set from the depot gets to be the normal 17:35. Fret not about the details, just know that a extra rush hour train runs all the way to Barking at the busiest time of the evening, sharing out the people who would normally have squeezed onto one train onto two. The 17:28 PIXC-buster eases travel for those interchanging from a train from Richmond, leaving the 17:35 to mop up the next crowd from Clapham Junction. My ride on the 'extra' train was almost comfortable, with space to lean against the bulkheads if not any spare seats. The journey was initially unremarkable and civilised, with an on/off drip of commuters heading quietly home. But we lost a few minutes on the approach to Blackhorse Road, which is where the busy Victoria line connects, so here were the multitudinous hordes I'd been expecting. They crammed in and packed out the train, so I can only imagine how bad it would have been if trains had been the normal 15 minutes apart. The PIXC-buster had done its job. Meanwhile the 17:35 departure was considerably quieter and did have spare seats, because being only six minutes behind it hadn't had time to fill up. This, you'll remember, was the spare set of carriages inserted into the system back at South Tottenham, but now with a muddy floor and no longer smelling of freshly-washed dishes. 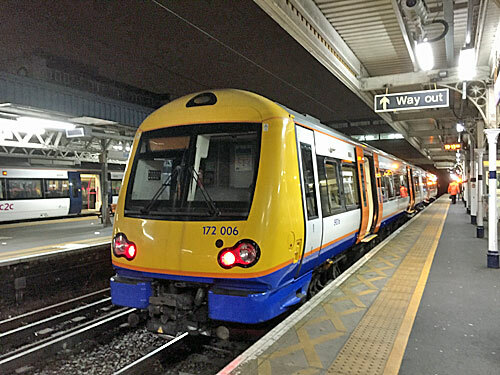 The spare train had one final surprise at Barking, which was to deposit us on platform 7 rather than the usual platform 1, because that was already occupied. A swift, passengerless departure was then required to make way for the 18:23 to Pitsea, which meant the driver taking a trip to the sidings, before returning half an hour later as a timetabled passenger service back towards the depot. And all this kerfuffle takes place every weekday evening, bringing the spare set of carriages into play simply so that commuters can be provided with one extra train where they're not packed in like cattle. Things'll be very different next year, when electrification's complete and new longer trains can be introduced. With four carriages rather than two, running happily ever after, the Goblin will no longer have to play with its PIXCs. There's also a morning PIXC-buster, which runs in the opposite direction. It starts at Woodgrange Park, not Barking, and slips into the middle of the gap between the normal 07:51 and 08:06 departures. It eases overcrowding all the way to Upper Holloway, and then does something highly unusual by skipping Gospel Oak because the platform's already full. It sits in the siding for a bit, with passengers on board, then continues (like absolutely no other train does) via all the other stations to Willesden Junction. Geoff's ridden that one, it's in his Secrets of the Overground video, part 1.